Isuzu Motors South Africa (IMSA) today reaffirmed its commitment to the South African market at the official launch of the company where they displayed the expansion of their product line up with the grand reveal of the Isuzu mu-X takin centre stage. The Isuzu bakkie and Truck range was on show with the future Isuzu models such as: X-Rider Black and Chassis Cab on display along with the AT35 prototype which is currently under study. Adding to the leisure and appeal of the Isuzu range, the legendary Isuzu KB is spruced up with the addition of the X-Rider taking on the Black styling and X-Rider Black nameclature in the interior finishing’s. The Special Edition KB 250 X-Rider Black will come standard in the Isuzu Black Meet Kettle body colour. 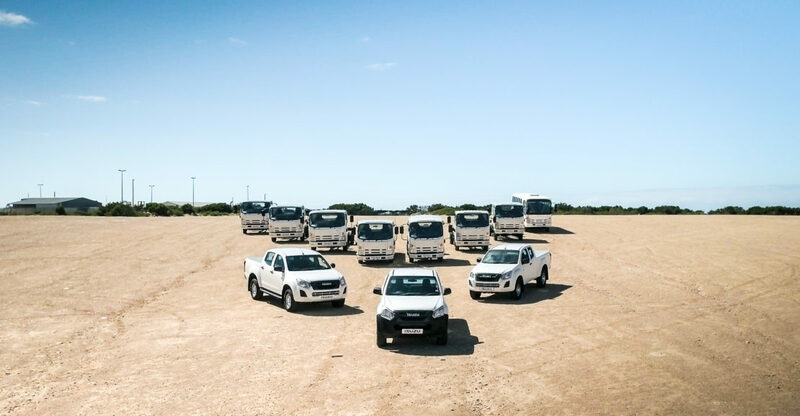 Joining the Isuzu KB portfolio is the Chassis Cab body style which extends the product range to 23 and 16 models in South Africa and Sub-Saharan. The Chassis Cab will be available in the Single Cab body style without the pre-assembled load box, lending opportunity for customers to assemble any desired aftermarket equipment to meet their specific business requirements. The KB 250 Chassis Cab will be offered in three model derivatives which include the LEED, LEED Safety and Fleetside Safety models and will be available in South Africa and our Sub-Saharan Africa right hand drive markets. On display at the launch was also the AT35, which is currently under study. The Isuzu D-MAX AT35 currently exists and is developed and sold by Artic truck in Europe. “We are presently working with Artic Truck to develop a locally built AT35 which will be fully homologated and approved by Isuzu here in South Africa,” added Rimmer. Both the Chassis Cab and Special Edition X-Rider Black will be available to customers in the second quarter of this year. Isuzu Motors South Africa is a wholly owned subsidiary of Isuzu Motors Limited of Japan. Isuzu has had a presence in South Africa since 1964, when the first commercial vehicles entered the market, which was soon followed by the introduction of light commercial vehicles in 1972. The brand’s popularity grew and resulted in local production of light commercial vehicles in 1978. Today, Isuzu remains one of South Africa’s leading commercial vehicle brands and has become renowned for its durability and reliability.